In 2007, my Master’s thesis partner and I carried out a field study researching the role and scope of low-cost private schools serving the children of low-income areas in Cali. 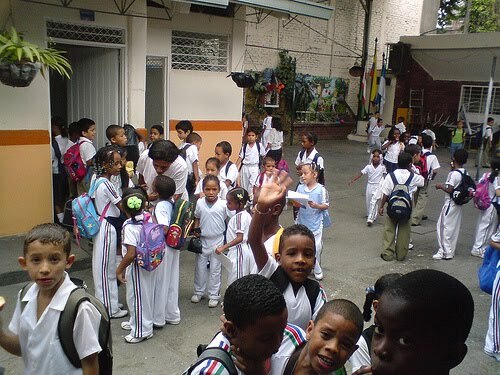 We managed to visit around 200 schools in the city’s largest and most dangerous marginalized area, Aguablanca. In our findings, we could confirm that the private sector’s share of schools and pupils constitutes a clear majority (85% of all schools and 64% of all pupils) and that the private schools perform better on two of our three indicators of quality (teacher activity and pupil-teacher ratio). On the third indicator (material inputs) the results were ambiguous; although the overall infrastructure was better in state schools, access to both computers and books was better in private schools. It’s not a surprise to anyone that private schools in general are more effective than “free” state schools. For many, however, it’s almost shocking to find out that low-cost private schools directed to the poor, first of all exist; secondly, that they capture such a large share of the poor children; and, thirdly, that they perform better than the state schools. On the top of that, they do this on much lower budgets! Teachers in low-cost private schools, although they are less qualified and much less paid, are more dedicated to the actual interaction with the children. Thanks to the much lower number of children per school, they have fewer children per classroom to attend and as a result both more time and more material per child at their disposal for the actual teaching. Besides thousands of private institutions providing educational services in the country, the Colombian private sector has a history of high participation in education efforts. Various foundations, entrepreneurs and other groups have supported with financial resources and human resources specialized on different aspects of education for the poor. 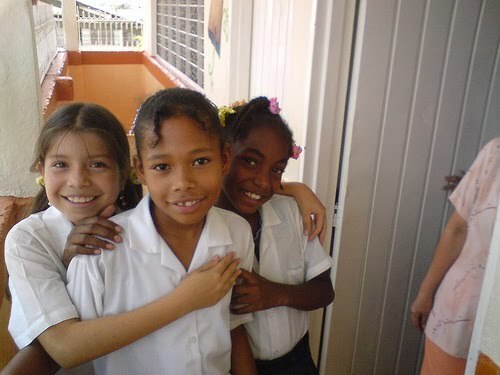 Similarly, numerous NGOs contribute to a great extent to the improvement of Colombian education. Despite of this, the resources are not enough to secure a quality education for the poor. Most monetary, technology and innovative investments, even from the greatest of the city’s foundations, are directed almost exclusively to the state schools, where they are managed ineffectively, and, although it’s great to read about some improvements in state schools concerning school environment, quality of education, absenteeism and coexistence etc., the impact of such improvements are far too small compared to the great amount of efforts pouring in. Today, a terrible amount of youths in ages 17 to 23 are left with nothing to do, being excluded from university studies in lack of secondary school diplomas, good enough grades or money to get access to a university. To attack this problem, an interesting law – and even more interesting if actually enforced – was written in 2006, regulating Education for Employment and Human Development; six beautiful words that not very surprisingly title very well what Cali and Colombia needs. The purpose of this law is to facilitate the provison of the skills and talents needed for successful performance of existing work tasks. This alternative to university education, if made accessible to all and in collaboration with the actual employers, sees an interesting future. The most recognized institution providing this service is the National Service of Learning (the SENA), which will be written more about in an upcoming article on Colombia’s ICT advancements. When it comes to higher education, well-off Colombians, but also top-performing or hard-working students from all socio-economic classes, can get access to top-class universities of international standards. Exchange programs to go abroad for advanced studies are also promoted through scholarships on the higher levels to help provide top-class Master’s and Doctoral level knowledge for the future leaders of the country. More than 70% of the institutions for superior education are private and costly (between about USD 1,000 and USD 3,800 per semester). Credits as a form of student loan are possible to get for high performing secondary students, but a great share of the university students has to work hard to afford higher education studies, with schedules running until 10pm. There is deep controversia globally about the government’s role and responsibility in education, especially when contrasted to the alternatives provided by the private sector. This is something that I feel passionate about sharing my thoughts on and learning much more about. The Education Business topic will therefore be discussed in more detail in an upcoming article. What contrasts the fantastically joyful spirit of the great majority of the approximately 45 million Colombians is the awful violence among the poorest spheres of the society. With violence, I will here only refer to unorganized everyday crime. Living with and around the lower to upper middle classes, and following certain safety routines, it’s easy to forget that the city of Cali has among the highest homicide rates in the country, and thus, among the highest in the world. In my well over four years of moving around in the city, I’ve “only” been victim of four different non-violent incidents. The first incident occurred after having refused to give some coins to a random man, who opened the taxi-door for me, as I stopped by the grocery store in the middle of the day. This provoked him to tell me he was going to wait for me outside until I returned. A few coins seemed to keep that threat away. A little more serious was the second incident, when a smiling man started talking to me as he came towards me along a main street around nightfall (6:30pm) suddenly indicating he had a gun in his pocket and “politely asked” me to give him some money. Taking out the bills I luckily had in my pocket, in total 15.000 pesos (8.4 dollars) was fortunately enough to stay out of trouble that time. At a later occasion, I was mildly robbed by a quite desperate guy who had spotted me after getting out of the same bus that he had been begging for money at. Following me at a distance while crossing the street, he suddenly appeared right behind me and had his hands in my pocket and grabbed my iPod that I stupidly enough had connected to my ears. Luckly, as he only concentrated on the device connected to my earphones, he left my wallet, my cell-phone and my laptop in peace. The last time, luck was with me again as a motorcyclist suddenly appeared from the wrong side of the street and, luckily enough, just ordered me to hand over my cell-phone, indicating that he had a gun in his bag. Having heard more than one story about motorcycle robbers ambitously stealing cars lately, besides their normal robbery activities, I didn’t hesitate at handing over my old, cheap cell-phone, which he incredibly enough accepted before hurrying away. He probably did not imagine that I, again, was also carrying my much more valuable MacBook in my Mickey Mouse folder. Amazingly enough, when my iPod was robbed, Colombian police efficiency had the guy and his armed companion caught before I had finished a pleasant conversation with the nice lady who had seen and reported the incident. She had immediately called the police and helped me indicate to a police motorcyclist that appeared from nowhere in which direction the robbers were running. Despite this fantastic efficiency of the police work, the following 9(!!!) hours at the police station and the fiscal department (including a detour trying to catch another thief, who appeared on the way) did everything but give me a good impression of the administrative part of Colombian law enforcement. Adding that I, a foreigner, had to correct the police officer taking my report on his Spanish writing did not help much to reward my intentions of helping the police teach the robbers a lesson. My five-minute story took more than two working hours to get on paper, after three hours of pure waiting for the staff at the fiscal department to get available, after three preceding hours of waiting for something else at the police station. Sadly, with administrative routines like these, it’s easy to understand the attitude of many to take the law in their own hands and try to revenge, no matter how dangerous, instead of letting the police and especially the fiscal departments do their job. In many’s opinion, too many resources are spent on the actual catching of the bad guys instead of preventing the guys from becoming bad. (In 2009, for the first time in Colombia’s history, investment in security and defense exceeded investment in education). No use is done “trying” to teach the criminals a lesson if the procedures to actually teach them a lesson don’t work. A focus is screamingly necessary on more effective fiscal work and even more on providing employment focused education and training, as well as on other constructive opportunities for the desperate and/or lazy youth. The last time I was robbed, of my cell-phone, I just went straight ahead to recover my phone number at the operator’s main office, where I also bought a new phone. With a one-hour delay, I just continued my day as planned, without reporting anything to any authority, feeling both angry with and sorry for the people making a living robbing others. Sad. Statistics indicate that 58% of Cali’s inhabitants think everyday crime is the city’s major problem. In 2010, 53% of the caleños considered the city to be equally as safe as the previous year and 17% felt that the city had become safer. The remaining 28% considered that the safety had worsened since the previous year, despite all, a huge improvement since 2006, when a tremendous 40% considered that the safety had worsened since the previous year. An increased presence of the police force is a result of this perception, as 37% of the citizens consider the police to be the main reason for the safety. In other words, the presence of the police force has a positive image in Cali, more positive than that in the country on average. The perception of security and actual security are of course two different things, however, but in 2008, the indicators of homicides were the lowest in the last 15 years in Cali (66 homicides per 100,000 inhabitants). Of the people interviewed, 26% affirmed having been victims of some kind of crime in the city. Of these, 79% had been victims of robbery on the street (national average being 72%), 15% robbed in their homes, 9% victims of fraud or deception and 7% had been victims of physical aggression. (Source: www.occidente.com). A chat at the police station with three former police officers, about everything from basketball to how to avoid getting an iPhone robbed, although somewhat entertaining, did not paint a very optimistic picture of the rough areas of the city. Besides their stories, the fact that all three officers were now wheel-chaired as a consequence of having been shot in duty only confirmed that the crime statistics of the city should be respected.